Remember how my post about this Friday’s return of Bites Off Broadway described Karen Hester’s food pod as the very first to launch under Oakland’s new interim policy allowing such recurring mobile food events? Not so fast. It appears that Clay Pod, a food truck gathering organized by LIBA Falafel Truck owner Gail Lillian, has wrested away that particular distinction. When Lillian’s Clay Pod opens for business at 11:30 this morning in Downtown Oakland — at the intersection of 15th and Clay — it will be be the first legally sanctioned food pod to launch under the new guidelines. But we’re splitting hairs. The main point: Oakland street food aficionados who have been lusting for an Off the Grid-style food truck event in their hometown, on the regular, will be getting a double dose starting this week. Meanwhile, Lillian is one of at least five food truck proprietors — not counting Bites Off Broadway’s Hester — who applied for a food pod permit from the City of Oakland earlier this year. Prior to the new policy, which was unanimously approved by the city council back in December, these pods — by definition, three or more food trucks clustered together — hadn’t been allowed in most districts. For her part, Lillian seems to have kept plans for Clay Pod under wraps until the city gave its final approval. In fact, she didn’t publicly announce the details of the pod until last night — first on LIBA Falafel’s Facebook page and Twitter feed, and then in an informal press release sent out via email. Here’s what you really want to know: Clay Pod will set up at 15th and Clay every Tuesday, from 11:30 a.m. to 2:00 p.m. Today, the three-truck pod will feature food from LIBA Falafel, Hapa SF, and Go Streatery. Moving forward, Korean BBQ purveyor Seoul on Wheels will alternate with Go Streatery on a weekly basis, and other trucks may make occasional appearances. Edit: An earlier version of this story stated that a food pod is defined as "two or more trucks" clustered together. 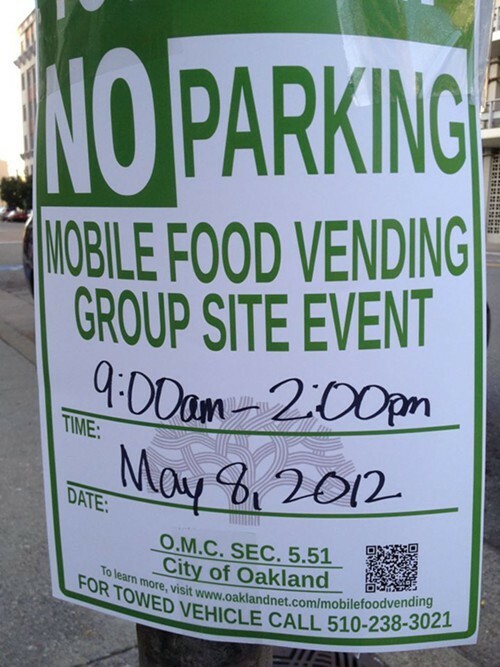 Oakland's interim mobile food vending legislation actually sets the bar at three or more.